Sometimes you may think that it takes a lot of efforts to get a huge number of viewers that will adore your website. Yet we want you to believe that your properties can easily get lots of attention from your target audience. 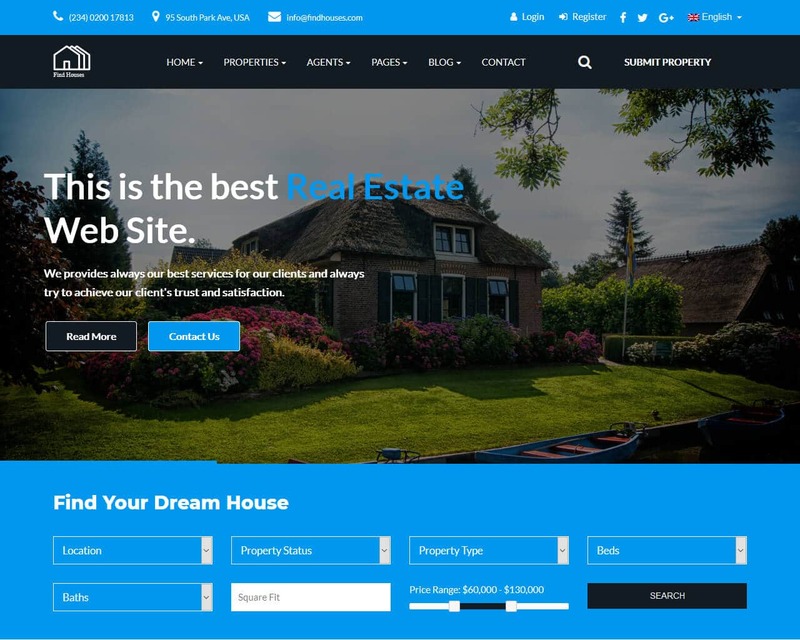 We prepared for you a selection of marvelous real estate website templates that will certainly make your business thrive. They will ensure a fast sale of your properties and allow you to fight off all competitors on this competitive market. With the help of these stunning template, you can create a professional online-presence that will show a high-quality of your business. In such a way, you can be sure that your customers will see the potential of your company and its capability to hit the target. These amazing ready-made solutions include an eye-catching gallery that will enable you to present your properties in the most user-friendly way ever. You should also know that all of these templates will capture your attention not only with their stylish looks. They will enrich a functional aspect of your website. For example, you can show a physical location of your agency, present different exciting details about your services, showcase testimonials from satisfied customers, and many other amazing things. In such a way, you can be sure that your services will capture the attention of all people who want to find their great houses in a flash. 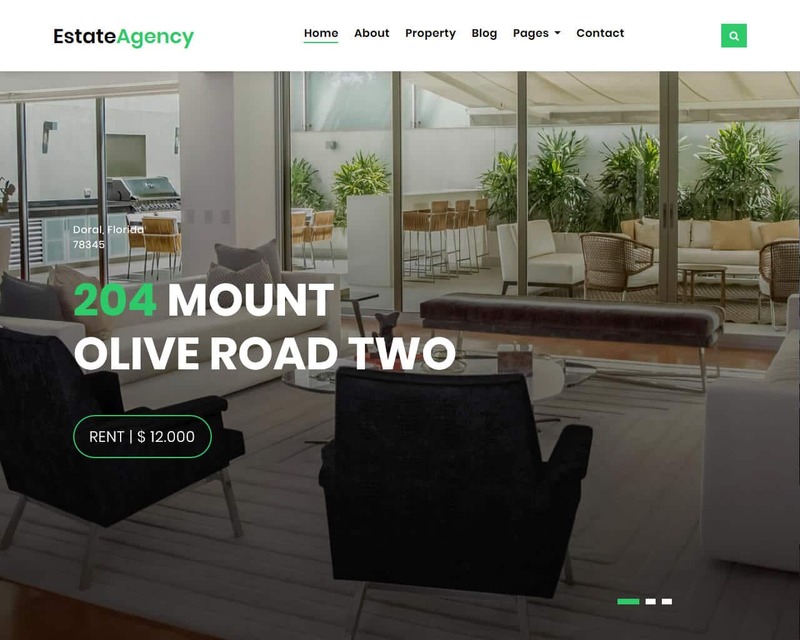 EstateAgency is a free excellent real estate website template created with Bootstrap. 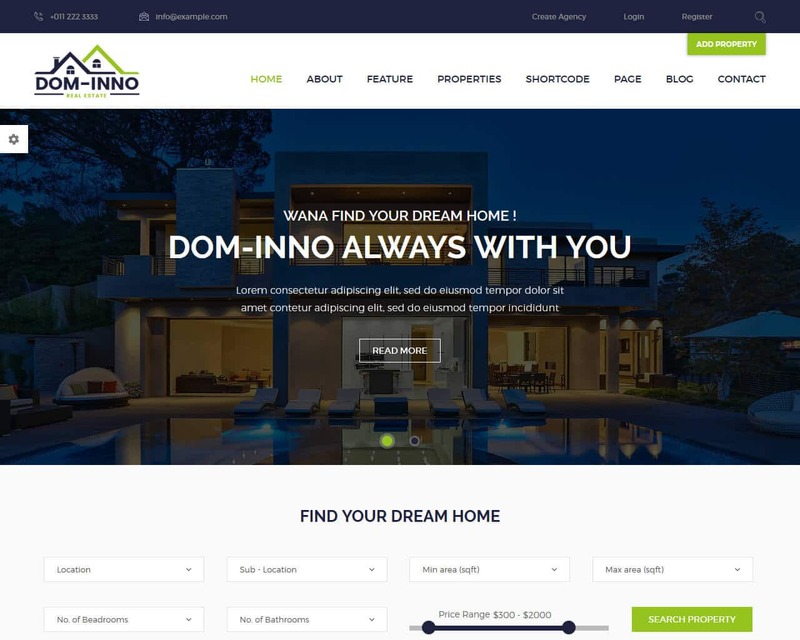 It’s sleek and built with latest technologies and makes sure your real estate web site is stable and flexible to always work smooth across all devices and platforms. EstateAgency comes with a sticky navigation, stunning homepage slider and unique off canvas property search form template. Whether you are an agent or an agency, EstateAgency is a great choice of template to launch your real estate website. Some of the other features of the EstateAgency template are: agents listing page, individual listing page, new/blog template, detailed property listing page with all the required elements. Assist people in finding their amazing houses using this marvelous template designed for promoting real estate business on the Internet. It will become your starting solution that will give you the opportunity to spread the word about your company and make people become interested in your services. In general, this wonderful theme comes together with a wide variety of options that will make your website become visually-attractive and functionally-rich. With the help of them, it will be possible to add a table with prices that will allow people to know how much your services will cost them. Furthermore, you can easily make use of the fully-functional slider with trademarks and subscription form that will turn your online-project into an extremely reliable one. In order to reach out to thousands of people, you can pay your attention to different widgets for social networks. Don’t forget to present your articles with the help of the powerful blog functionality that will allow users to find out more information about your business. Dominno is a stunning template that will impress your imagination with its capability to hit the target without any efforts. If you’re a property manager or real estate developer, you need to bring this out-of-the-ordinary to your notice. By means of this great solution, you will get a wonderful solution to display a wide range of properties and build a strong communication with your potential customers. 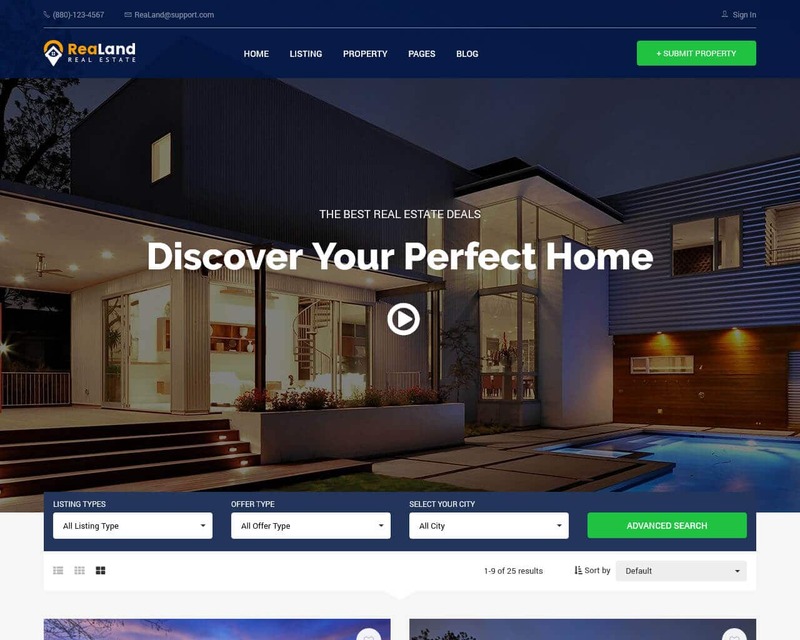 It comes together with 16 homepage styles that will allow you to catch the eye of all people who want to find their perfect home in a flash. You will also get lots of pre-made pages that will make it possible to show off various aspects of your real estate business and make sure that it looks trustworthy. In addition to this, you will get a professional mega-menu will allow you to divide your information into categories that will guide users through your online-project. By the way, you can take advantage of various color options and Google Fonts that will give you the opportunity to tweak the appearance of your website. 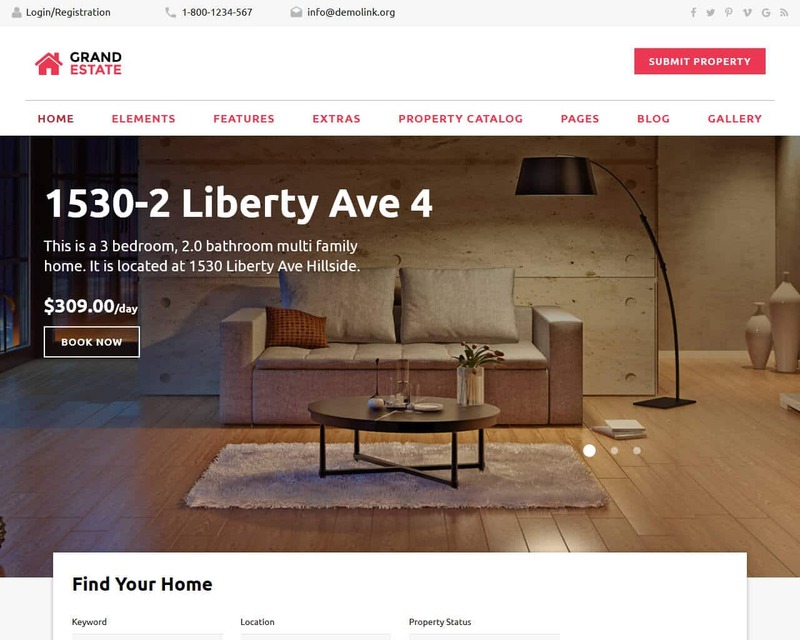 If you need to present your real estate business, make use of this stunning theme. It will provide both you and your visitors with lots of amazing functions. Moreover, everyone will be impressed with its modern design. In order to win the hearts of your target audience, you should not throw away this variant. Just take a look at multiple fully-fledged options to find out more about this great theme. good-looking types of the gallery to show off your properties in the best possible light. This wonderful template has a fashionable design. Without a doubt, your visitors will be happy to browse such a beautiful website. They will be always ready to communicate with you if they have questions. A remarkable theme that can be called a great variant to share your professionalism in the sphere of real estate business. Thanks to this amazing template, it will be possible to create a unique website that will impress your target audience and work with its colors, fonts, backgrounds, and many other elements. Together with this beautiful template, you will get a great number of stunning pre-made pages. They will allow you to present all essential details about your services and their benefits. You will also get a marvelous collection of amazing animation effects and transitions that will brighten your online-project up. With the help of the powerful Google Map, you will get the opportunity to show a physical location of your company and make your website become more trustworthy. In order to give your visitors a feeling of true depth and immersion, you can pay your attention to a fully-fledged Parallax effect. 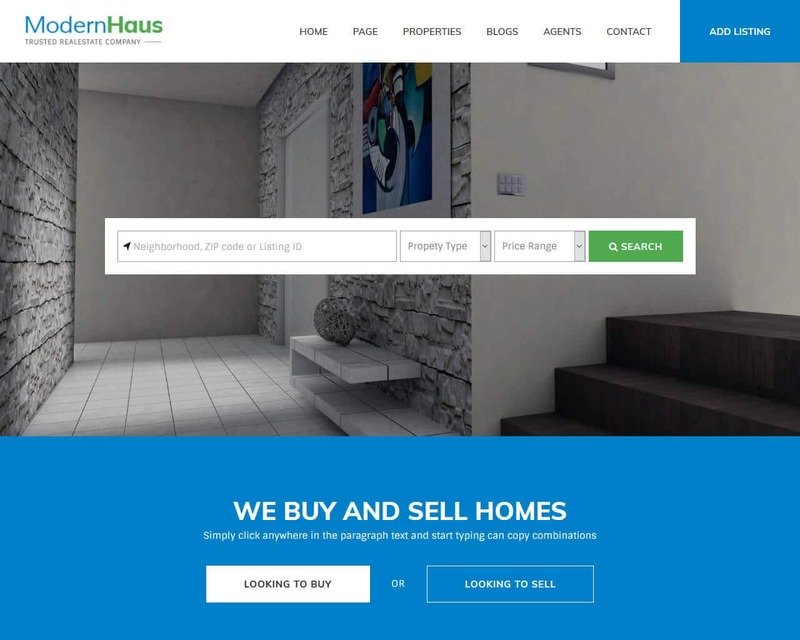 ModernHaus – A very creative, modern, elegant, clean template that is ideal for all Real Estate website, agencies, and agents. Choosing this template will definitely help improve your online appearance hence taking your business to the next level. It is inclusive of five totally different layouts for the homepage to enable you the ability to customize your site without any struggle. It is entirely based on Twitter Bootstrap and is fully and highly responsive. ModernHaus is clean and has a very modern look, and the design is made of a unique concept. Google fonts and maps with a marker have been fully utilized. The layout is out of this world, and this will definitely get you more views on your site and also increase revenue for you. It is the easiest template to edit, and it gives you a lifetime of updates at no cost. This template is a good choice for all beginners. Find Houses is a modern and clean Real Estate template. It is very suitable for the Real Estate industry that includes, Agents, Companies, Rentals, Real Estate, Houses, and of course apartments. 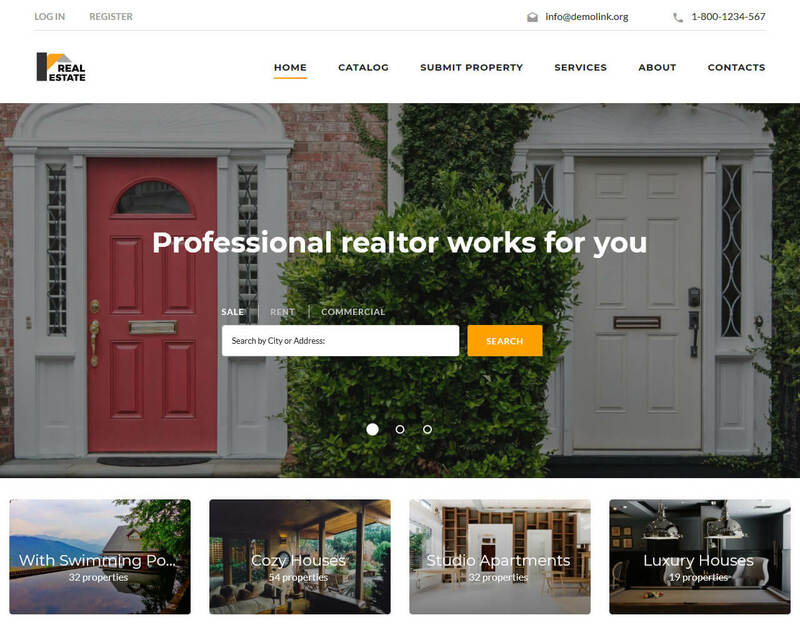 Find houses is a business template, that assists online presence for Real Estate Firms and Corporate Businesses. It has an elegant and stylish UI and very many features that are related to this particular industry. It has a highly upgraded property search and filter, property maps that have been built with Google maps API. Find Houses comes with a profile page for the key agent with any relevant information regarding them and all the property details that your client may need. It also has diverse styles for all your property needs. Inclusive is eight (8) layouts for the Homepage, which enable you to have great options for customization. 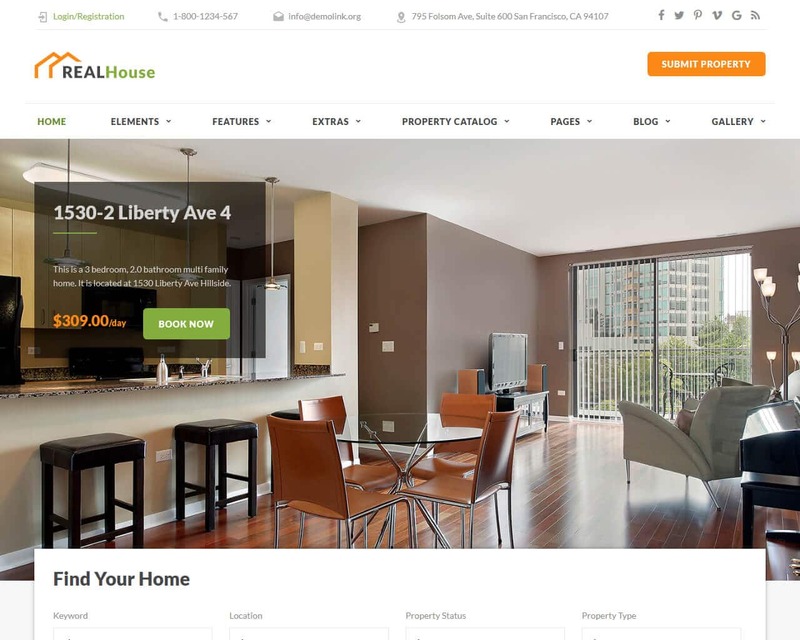 Find Houses is very responsive making it suitable for your website. ReaLand is a professional template that is perfectly laid out, classy and neat, superb and its uniqueness outstands as compared to all other templates. 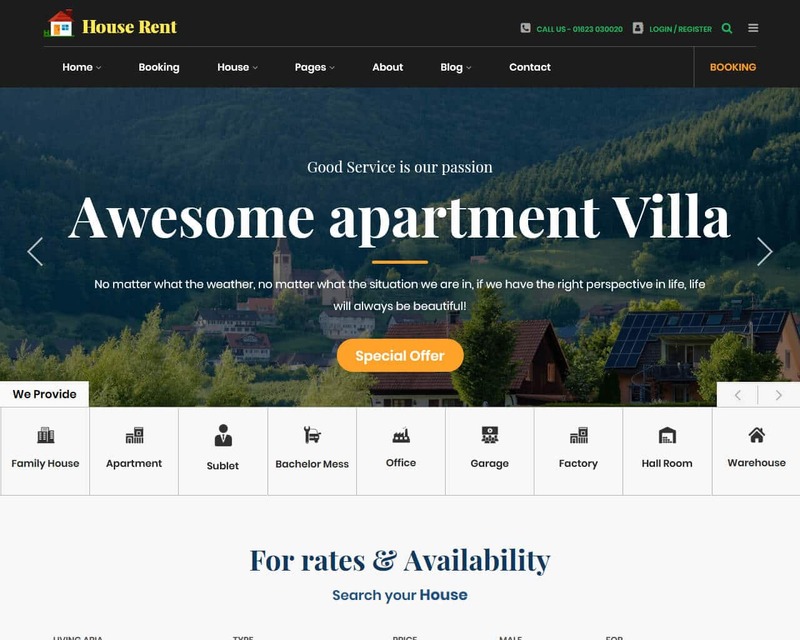 If you are interested in improving your online presence, attract a new lot of clients and get houses for them, this template is the most professional solution. 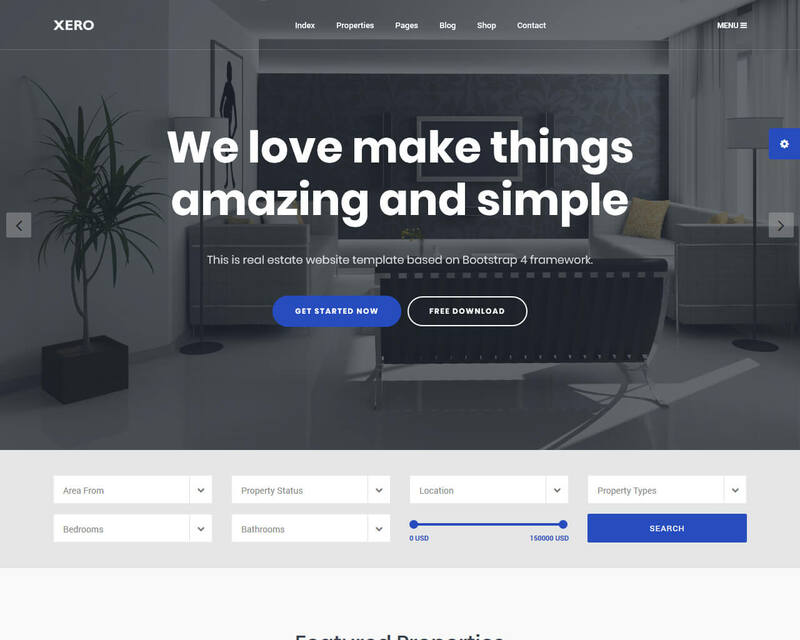 If your online project entails selling houses, rentals, apartments, or even create property listings, then ReaLand is the perfect template for your website. ReaLand comes with a high user interface kit that has a broad variety of different website elements that are coded and carefully designed. These elements include typography, widgets, an input field and many more. Depending on the intention or the purpose for your page, you will get pre-built variations of footer and header and many blog layouts. With ReaLand, it is guaranteed that your business will go to greater heights. 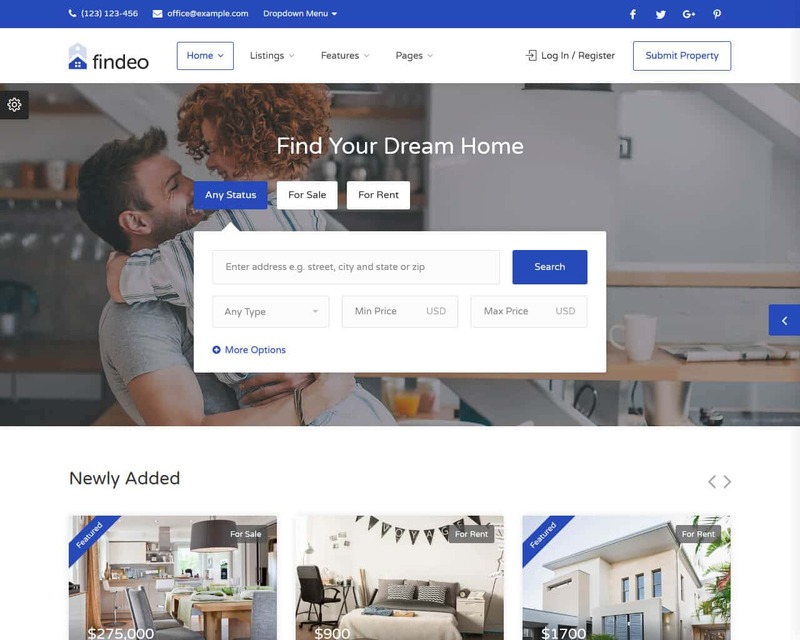 Findeo is a perfectly laid template for online directories, Real Estate Agencies, and brokers. It comes with a very straightforward and easy code that allows you to change whatever you feel you need at any given time. The code is neatly done, and it will give you great pleasure to use. It comes with the most defined and amazing features to help your site startup. Some of these features are, Google maps integration, retina ready, it is built with Bootstrap three, it has highly advanced forms and detailed documentation. Apart from that, it has highly responsive pricing tables, and it is compatible with cross-browser and all other browsers that you can find online, it has a sleek, elegant and smooth design that allows your site to catch the attention of your audience making them interested in what you are offering. 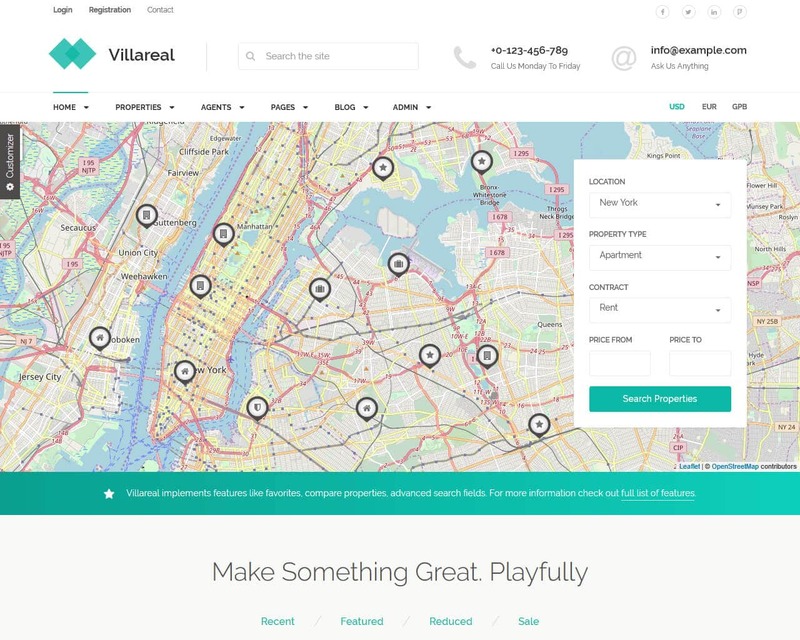 Villareal - A modernized real estate application kit, for different portals and real estate agencies. 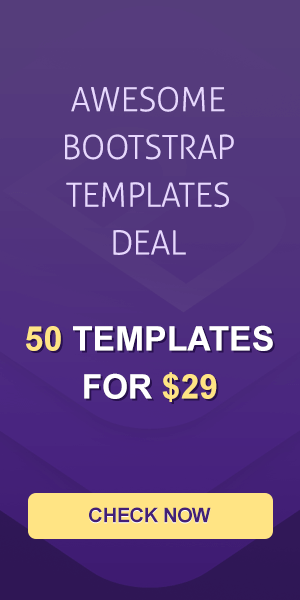 It has been built with Bootstrap Framework which offers the best development and customizability experience. It incorporates numerous real estate structured components. With this template, you can display your layout in standard or tabs. The page where you can find details has a description, property attributes, gallery, image, land valuation, reviews, inquiry form, and amenities in no particular order. With Villareal, you are able to display information about the agent or the agency. You can also display listings with the use of pagination. Available, you will find a row, small and boxed version. The details for the agency and the agent are readily available. You will not encounter any issue in case you decide to change the template to a directory portal for real estate. 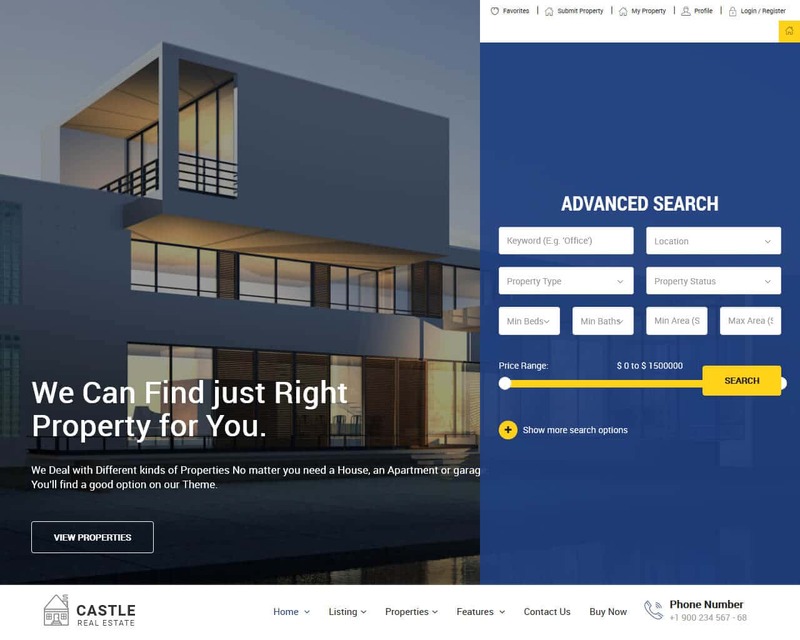 Castle is a premium template that is related to all Real Estate websites. It comes fully loaded with amazing features, clean, modern, elegant, sleek and simply nice. Everything about the template is made with full responsiveness. To prove this, you can go on and check the castle on your mobile devices. Castle property listings give numerous variations for property listings such as grid, listing, map listing, grid view and grid with a map, a list with the map all combined. The design encompasses the requirements of almost all individuals involved in the real estate industry. The design is well thought of and adds so much life and vigor to your site. Most of the templates you find out here will often be too basic or generic, but this one is an obvious catch. The theme also expounds a thoughtful design. It is capable of resizing itself automatically which makes it user-friendly and easy to use on all devices. Homy is the perfect choice for all websites that are related to Real Estate. It is highly modernized and built with Bootstrap framework. Its code is well commented, straightforward, easy and very neat. It is carefully designed to ensure that the user is able to customize it fully without encountering any problems. Homy is most preferred when it comes to Business websites, Apartment, Rent villa, Property, Construction and many more. It comes with the most amazing feature you will find, that is twenty pages and above, five homepages, it is clearly documented, it has an already working AJAX form, it has a sleek and pixel perfect design, a full-screen video background, it is also fully responsive and compatible with different browsers. This template is easy to apply and will create a good flow of customers on your site because it is beautifully laid and attractive. 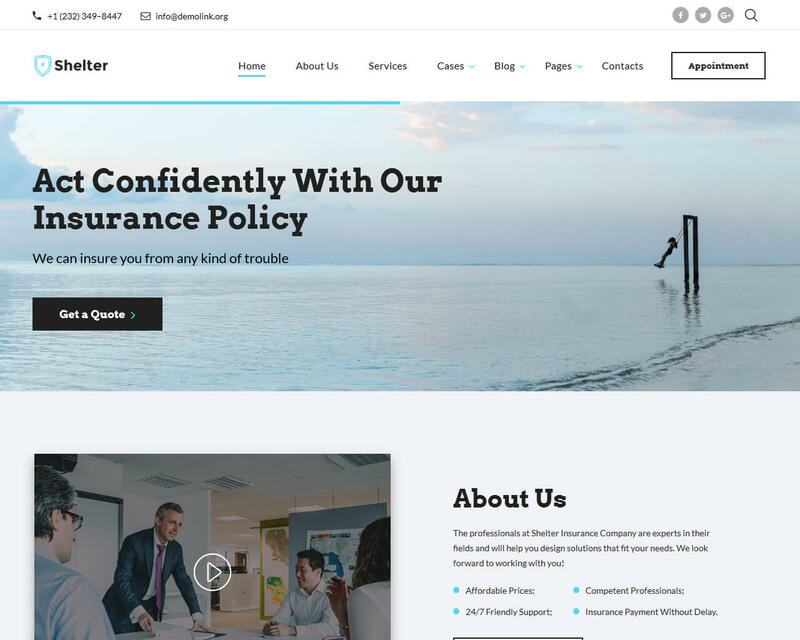 Shelter is an attractive theme that will make it extremely easy for you to create a fast and reliable website without any efforts. It comes alongside a great blog functionality and four eye-catching blog layouts that will allow you to post various interesting articles about your business and its advantages. In such a way, you can be completely sure that people will be ready to entrust in your services. This exciting template also has a powerful social network support. Thanks to this amazing option, it will take you nothing to spread the word about your real estate company all over the world. In order to make your website get more impressive look, you can take advantage of different gallery types that include masonry, cobbles, and grid. It will be also possible for your customers to request an appointment directly on the website using a wonderful appointment manager. By the way, you will also get a bunch of animation effects that will turn your website into a remarkable one. Intense is a wonderful template that has the power to showcase your amazing properties in the best possible light. It has a lot of powerful features that are considered to be essential ones when it comes to a real estate website. To start with, you will get various working Ajax forms that will make it easier for your potential customers to reach out to your team. Thanks to an incredible website slider, you will be ready to showcase your offers in a spectacular slideshow. In addition to this, you will get the opportunity to animate your static graphics with a marvelous Parallax effect that sets multiple content layers in motion in a process of scrolling. You will be also happy to get a huge number of social options that will guide your loyal and new readers to your social media profiles. In such a way, your business will definitely become popular on the web and capture the attention of people from all over the world. 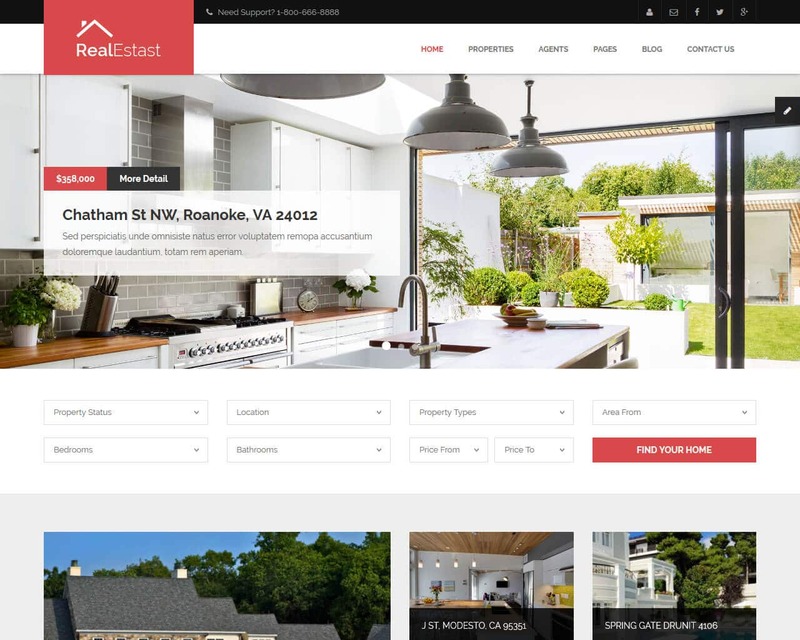 REALESTAST template is the best method to use when trying to sell property online. The template is appropriate for all Real Estate Companies; however, it can be used for businesses and portfolios. It is built by the use of the latest techniques. It has a very comprehensive file to help you make any changes to whatever it is that you prefer. It is already customized which it makes easy for all beginners and those with no clue at all. The best thing about us is that if you feel confused or need help with customization, you can contact talk to us, and we are glad actually to be of any assistance. Now the features of this template are what makes it very unique, it has seven different color variations, it has different layouts to ensure that you have enough options. The layouts allow you to display your property as per your liking. It is also well documented. HouseRent is a powerful solution that will impress your imagination with its brightness and unusual appearance. It comes together with eight homepage variations that will add more elegance to your future online-project. It also has five header styles that will also make it possible to make your website look unique. You can also pay your attention to a great hamburger menu, advanced search form, and Google Map. Thanks to a marvelous booking form, it will become possible for your customers to request an appointment directly on the website. Furthermore, an eye-catching banner will give you a wonderful chance to highlight the most important information out of your website and make people become interested in your brand new offers. In order to provide people with all needed information regarding your business, you should certainly make use of about page, contact page, apartment single page, and other elements included in the package. 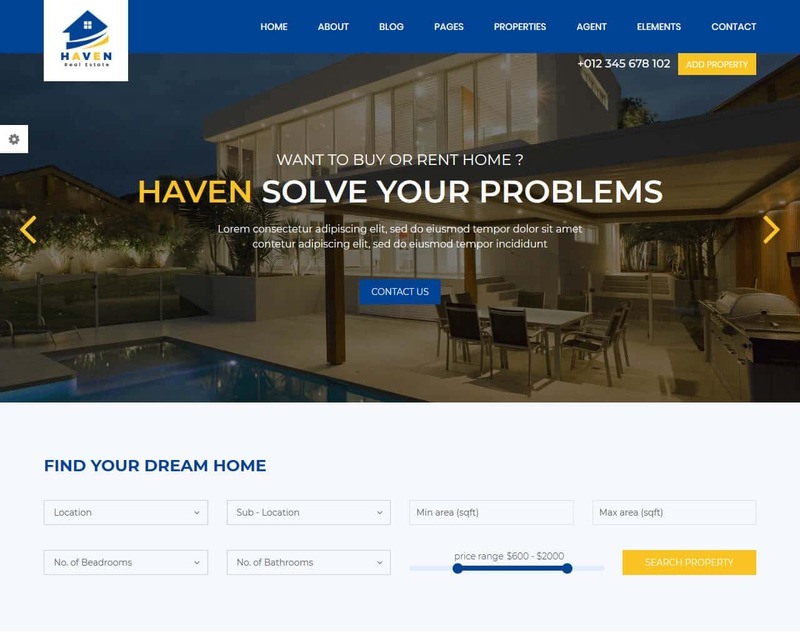 A modern and stylish template that will make people believe that your real estate agency can solve all their problems regarding a search of their great house. It comes together with 9 different versions of the homepage that will turn your website into one that catches the eye of each person immediately. 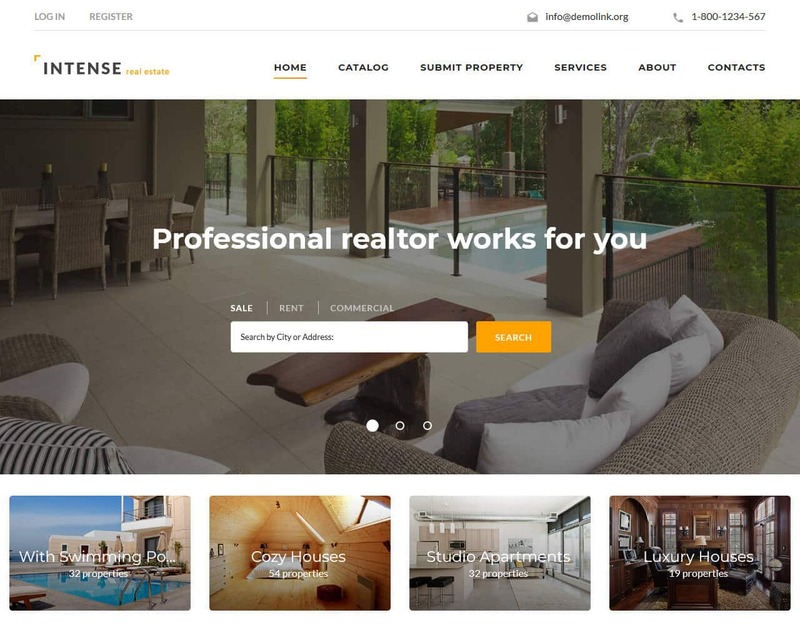 You will also get 11 real estate pages, six property pages, and three agent pages that will allow you to present your properties in the best possible light on the Internet. Don’t forget to make use of some specific pages that have the power to list agency and agent-related information in an out-of-the-ordinary way. In order to make a user-experience better, you can make use of the amazing mega-menu. It will give you the opportunity to divide your content into various categories that will make it easier for people to find what they are looking for. You will also get different color schemes and Google Fonts that will allow you to work with a look of your future website. An impressive theme that will definitely win the heart of each person who is looking for a trustworthy real estate agency. What essential features will you find in this very package? To start with, you will get a wide range of customization options that will allow you to work with a future look of your website. If you want to share your thoughts with a target audience, you can always take advantage of the stunning blog functionality. Thanks to this handy feature, it will be possible to convince people of your professionalism. In order to make your photos look even more attractive and make them suit your topic at its best, you can take advantage of various gallery types. It also includes lots of working forms that will make it possible to communicate with your team and find out more about your services. Moreover, you can add some amazing visual tricks to your website using a great Parallax effect. 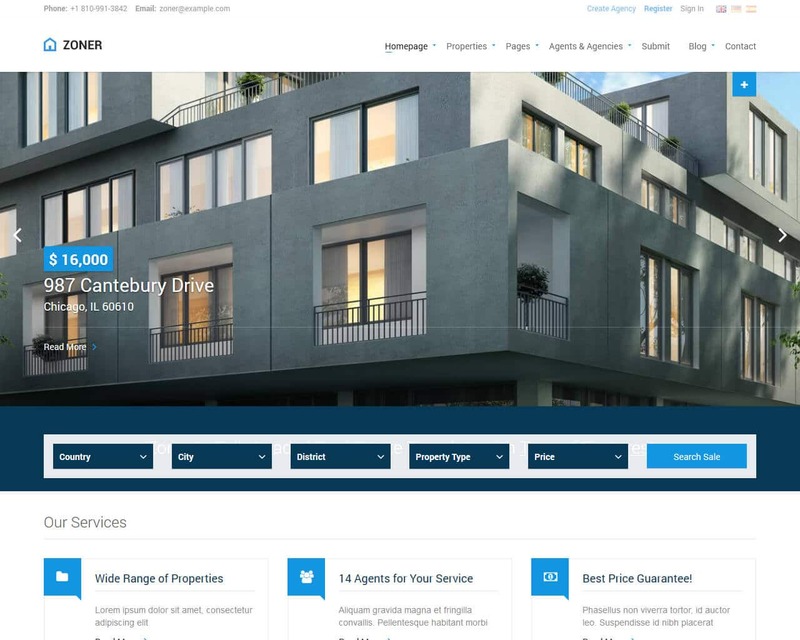 Zoner is a real estate template that comes fully loaded with amazing features. At the first template on the theme forest, you will find an open street map; you are also privileged to get Google maps as well. It is entirely up to your taste to choose the map provider that you like. It has parallax map scrolling which makes your search very accurate. The first template on Zoner also helps you to get a parallax effect for the map that is very modern. If you are on a quest to impress your visitors, then Zoner is the way to go as you will get uniqueness in all contents. 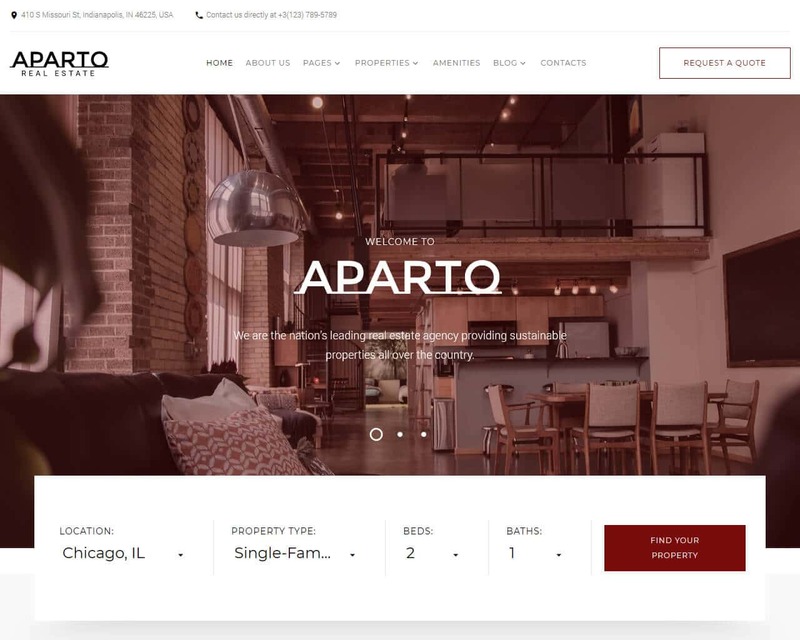 I don't know whether you like Masonry effect on your site since you are dealing with real estate but if so you are lucky, with this template, you will get an amazing listing to your property. You have the option of choosing the icons and markers that you prefer although, you are not limited to use ones that you have prepared. This is a real estate template that is uniquely designed to meet the expectations of your audience. It is created with Twitter Bootstrap which adds more power and strength to it. Xero is suitable for all agencies, property, rentals, agent, retina ready, corporate and apartment. The template is made fully responsive. It comes with eight layouts of the homepage. There are awesome font icons, and flat icons are used. Xero has very simple drop-down navigation, a mega menu, wow animation and Google fonts are used, it is very easy to customize so you can be sure that you will have no trouble to make any changes where you feel change is needed. It can be used on all types of mobile devices, from just a simple mobile phone to a desktop. The best part is that it is compatible with all browsing sites that are available online. This is a good template for a beginner as it is very easy.